Yes, I am unique, but, by my looks and my doings it could be said that I am eccentric. Indeed! There is absolutely nothing out of center in my present life and if anyone takes a closer look in my way, that one will be delighted to make it in my unique and fascinating world of my own! Well, I am doing a major clean up in my computer—reinstalling everything and starting fresh! But it is taking forever to download my programs because of slow Net connection. Father, I am frustrated not being able to work because I do not have the programs installed, but You know it! It’s now 3:26 pm and I have not been able to finish installing my programs at all! I do not know what is wrong with my computer and I fear that I might have to buy yet another program, but, You always make a way to relieve me from these frustrations. I wait on You! Well, well, well! O my Father, I have no idea of what is going on with this computer! I re-installed Windows and I thought I had placed it in the main partition, but, evidently I did not! I actually installed it over my second OS! Now what? I will see and learn! This is all Your doing! Thanks my Father for all that You teach me! And in the process of learning computer skills You are instilling within my being Your wisdom more so as the days go by in my careless way of doing things! Truly, I am unique as the rose I intent to use in my new desktop background—no two ways about it, each one of us is uniquely arranged in the picture of our lives—is a fascinating thing for me! All flowers in the field & the amethyst rose that so much fascinates me, are unique & different, but, they make a unique arrangement in the lonely road going far there yonder in my life’s journey, so we, too, can make a unique arrangement to delight the eyes of the viewers in our own lonely roads! Even so, by all means I will continue my fascination with Yahushua—my Master—my Teacher for He always leads me to the left or the right whichever way is the right way to go in my journey by His side…. 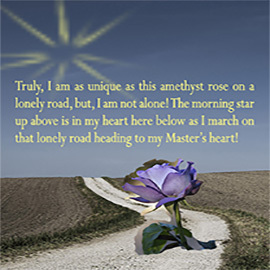 Truly, I am unique as this amethyst rose on a lonely road, but, I am not alone! The morning star up above is in my heart here below as I march on that lonely road heading to my Master’s heart! I really enjoy your openness and honesty. Great posts!